(Archived) Think You Know Sam--Here's a Test! Think You Know Sam--Here's a Test! When THE BIG PHOTO is snapped Tuesday, and the cake is all gone, participants will be able to take with them an institutional memory, autographed even. Tuesday's activities begin at 11 a.m. at Austin Hall, with a processional to the intramural fields east of the campus and a group photo scheduled for noon, with birthday cake to follow. Copies of "Sam Houston State University: An Institutional Memory 1879-2004" will be available at a table in the photo area, complete with author Ty Cashion. By bringing along $49.95 you can save the $5 shipping and handling cost. Copies of the 10 x 13-inch color laminated panoramic photo will also be available for $20 each, and individuals can purchase them by going online to download the order form or by going directly to the photographer's web site. 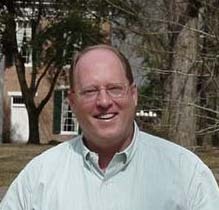 Cashion said this week that research for his book, which was completed as a 125th anniversary celebration project, provided some interesting insights and tid-bits about the oldest teacher-training institution in the Southwest, and the third oldest public institution of higher learning in Texas. "For starters, not everyone knows that this is the university's 'quasquicentennial'," said Cashion. "Sam Houston State has already celebrated its 'centennial' in 1979 and 150th celebrations are called 'sesquicentennials,' but we had to dig a little to find what this one is called." With his quasquicentennial project in hand, Cashion sat down this week and compiled a list of 10 questions, which he believes will separate the knowledgeable Bearkats from the newcomers. Here are the questions, with the answers at the bottom. Cashion said that anyone coming up with 10 of 10 can call himself or herself a Texian, a term Sam might have used in reference to himself as an early settler. Seven to nine correct answers get you in Cashion's "BearKub" category, and less than that, the "you'll need to read my book and try again" group. Cashion also warned that he's not above sneaking in a tricky question or two. 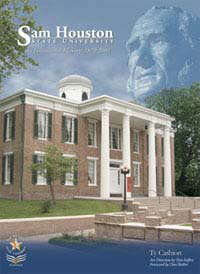 1) What was Sam Houston State University's first institutional name? 2) What other names has it also been known as, and when were the name changes made (within five years on each)? 3) What is the university motto? 4) What is the name of the school's one-time, unofficial canine mascot? 5) What Texas holiday also commemorates the day in 1879 when Gov. Oran M. Roberts signed the legislation that created the institution? 6) What were Sam Houston sports teams called before they became "Bearkats?" 7) At the time the school acquired General Sam Houston's Woodland Home, what was it being used for? 8) Name Sam Houston's most famous graduate in the fields of acting, journalism, and politics? 9) What sport provided Sam Houston's first national champion? 10) How many legs did Tripod have? 1) Sam Houston Normal Institute. 2) Sam Houston State Teachers College (1923), Sam Houston State College (1965), Sam Houston State University (1969). 3)"The measure of a life is its service." The line is from "The Witness," a story by Mary Raymond Shipman Andrews. 4) Tripod. (See, you thought this was a trick question). 5) San Jacinto Day, April 21. Sam Houston was created on April 21, 1879. 7) The Smedes Valley Boarding House for Girls. If you said a hay barn, give yourself a half point, because it saw earlier use in that capacity as well. 8) Dana Andrews (A leading MAN of the 1940s and '50s, Dan Rather ('53), and Thaksin Shinawatra ('79), current prime minister of Thailand. 9) The rodeo team won its first National Intercollegiate Rodeo Association championship in 1956. The baseball team won the National Association of Intercollegiate Athletics (NAIA) tournament in 1963 and the football team was NAIA co-champion in 1964. The 1973 basketball team was the college division national champion in two wire service polls. There were also NAIA golf championships in 1978-'81, and softball in 1981 (NAIA), 1982 (NCAA Division II), and 1993 (National Invitational Tournament). 10) Tripod had all four legs. One of them was withered, and he tucked it into his chest when he walked, leading to the oft-stated reference to the "beloved three-legged mascot." Cashion wrote the book as a contribution to the 125th anniversary celebration and will not receive any of its proceeds. He thanked all his colleagues in the history department and his many sources for their assistance in the book's production, and was especially complimentary of the design and artwork contributions of Tom Seifert, associate professor of photography. "If you didn't make a good score on the quiz," he said, " you can still become a Texian by buying the book."